March 5, 1953 Mosima Gabriel “Tokyo” Sexwale, anti-apartheid activist, former political prisoner and businessman, was born in Transvaal, South Africa. Sexwale became a member of the Black Consciousness Movement in the late 1960s and in the early 1970s joined the African National Congress’ armed wing. In 1975, he went into exile to undergo military training. Upon his return to South Africa in 1976, he was captured, convicted of terrorism and conspiracy, and sentenced to 18 years at Robbins Island. 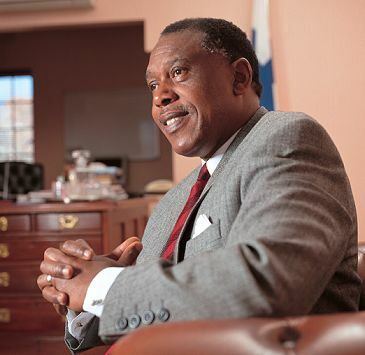 Sexwale was released in 1990 and in 1994 was elected the first premier of Gauteng Province. He resigned from that position in 1998 and founded Mvelaphanda Holdings, a company focused on mining, energy, and related sectors. He also chairs and serves as a director of several other companies. Sexwale is also a trustee of the Nelson Mandela Foundation.